Why are more of us dying of Cancer? With such a big title I should of course write a huge article, but time is not with me on this one. Still I wanted to get some info down based on a bit of research I was doing, on whether we are curing cancer or not and it made fascinating reading so I didn’t want to loose it. Basically I started at seeing if we as a nation are developing Cancer at a faster rate than before, which interestingly is a difficult figure to come up with. What I did find from the article published by the UK government back in 1999, shows quite emphatically it is. 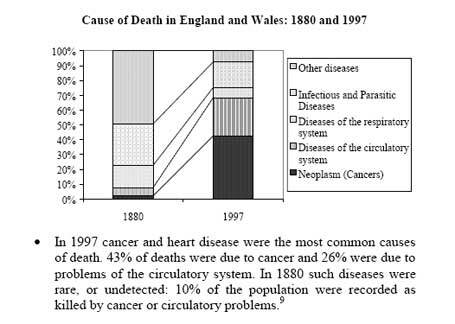 In it it shows that back in 1880 10% of all deaths were caused by Cancer and in 1999 43% as the graph below shows, so I thought I would do a bit more digging and I have to say nothing is straight forward when it comes to stats. Between 1971 and 2007, the age-standardised incidence of cancer increased by around 21 per cent in males and 45 per cent in females. You have to say it is very scary and there is no doubt that we are more likely to get one form of cancer, in fact the title of the article says that “1 in 3 people are likely to get cancer.” Which explains why we all know someone with this deadly disease. It is therefore obvious that our life style eating habits, what we drink, the chemicals in the food, our diet etc is all having an effect. This only goes to prove if we can change the way we eat etc., then we have a better chance to survive! Then for some reason I decide to look at skin cancer or as it is also known as Melanoma, which apparently is now the fastest growing incidences of cancer. The question is, is it the ozone layer or could it be the sun creams that we have started to use to help protect us is resulting in such a sudden increase in Melanoma? Don’t call me a cynic but this makes interesting reading “Could Sunscreens Increase Melanoma Risk?” If you then consider there are $1.9 billion sales of sun creams, then obviously the manufacturers do not want to let this info out. Also you may find that this article makes very good read and goes into more depth on the John McCain Melanoma cover up. Still this all isn’t new to me as I covered this once before on this site with Does the Sun cause Skin Cancer? To finish I read that finally someone is finally trying to get this exposed no other than Senator Charles Schumar, lets hope he can wins!! This entry was posted in Scientific research into Cancer on July 30, 2010 by admin. Very nice to walk through your information at your website. We are also involved with healthy aging since +25 years, mainly based on the Bio-Electronic Vincent science of life. We understand that the quality of the flaxseed and its oil but also that of the quark can influence the technique of Johanna Budwig’s oil-protein therapy. Find attached extra information about these unique probiotics, the Lesik® ferments of life, they have following very exceptional BEV parameters (pH 5, rH2<1). Read further at our related site http://www.fermentsoflife.com . It will take only 1 gram of Lesik® starter powder to make 1 liter of unique fresh quark at ones home. All our Lesik® ferments/probiotics come in 50 gram sealed containers (including a small 1 gram spoon). Read more on the Bioelectronics Vincent, the healthy ferments, healthy living and aging in the “EnjoyVity®” Ebook at our site http://www.enjoyvity.com . Convinced these details make it your readers possible to improve their health protocols.